Chartres Cathedral, also known as the Cathedral of Our Lady of Chartres (French: Cathédrale Notre-Dame de Chartres), is a Roman Catholic church in Chartres, France, about 80 km (50 miles) southwest of Paris. Mostly constructed between 1194 and 1220, it stands at the site of at least five cathedrals that have occupied the site since Chartres became a bishopric in the 4th century. It is in the Gothic and Romanesque styles. It is designated a World Heritage Site by UNESCO, which calls it "the high point of French Gothic art" and a "masterpiece". The cathedral has been well preserved. The majority of the original stained glass windows survive intact, while the architecture has seen only minor changes since the early 13th century. The building's exterior is dominated by heavy flying buttresses which allowed the architects to increase the window size significantly, while the west end is dominated by two contrasting spires – a 105-metre (349 ft) plain pyramid completed around 1160 and a 113-metre (377 ft) early 16th-century Flamboyant spire on top of an older tower. Equally notable are the three great façades, each adorned with hundreds of sculpted figures illustrating key theological themes and narratives. Since at least the 12th century the cathedral has been an important destination for travelers. It remains so to the present, attracting large numbers of Christian pilgrims, many of whom come to venerate its famous relic, the Sancta Camisa, said to be the tunic worn by the Virgin Mary at Christ's birth, as well as large numbers of secular tourists who come to admire the cathedral's architecture and historical merit. As with any medieval bishopric, Chartres Cathedral was the most important building in the town – the centre of its economy, its most famous landmark and the focal point of many activities that in modern towns are provided for by specialised civic buildings. In the Middle Ages, the cathedral functioned as a kind of marketplace, with different commercial activities centred on the different portals, particularly during the regular fairs. Textiles were sold around the north transept, while meat, vegetable and fuel sellers congregated around the south porch. Money-changers (an essential service at a time when each town or region had its own currency) had their benches, or banques, near the west portals and also in the nave itself. Wine sellers plied their trade in the nave to avoid taxes until, sometime in the 13th century, an ordinance forbade this. The ordinance assigned to the wine-sellers part of the crypt, where they could avoid the count's taxes without disturbing worshippers. Workers of various professions gathered in particular locations around the cathedral awaiting offers of work. Although the town of Chartres was under the judicial and tax authority of the Counts of Blois, the area immediately surrounding the cathedral, known as the cloître, was in effect a free-trade zone governed by the church authorities, who were entitled to the taxes from all commercial activity taking place there. As well as greatly increasing the cathedral's income, throughout the 12th and 13th centuries this led to regular disputes, often violent, between the bishops, the chapter and the civic authorities – particularly when serfs belonging to the counts transferred their trade (and taxes) to the cathedral. In 1258, after a series of bloody riots instigated by the count's officials, the chapter finally gained permission from the King to seal off the area of the cloître and lock the gates each night. Even before the Gothic cathedral was built, Chartres was a place of pilgrimage, albeit on a much smaller scale. During the Merovingian and early Carolingian eras, the main focus of devotion for pilgrims was a well (now located in the north side of Fulbert's crypt), known as the Puits des Saints-Forts, or the 'Well of the Strong Saints', into which it was believed the bodies of various local Early-Christian martyrs (including saints Piat, Cheron, Modesta and Potentianus) had been tossed. Chartres became a site for the veneration of the Blessed Virgin Mary. In 876 the cathedral acquired the Sancta Camisa, believed to be the tunic worn by Mary at the time of Christ's birth. According to legend, the relic was given to the cathedral by Charlemagne who received it as a gift from Emperor Constantine VI during a crusade to Jerusalem. However, as Charlemagne's crusade is fiction, the legend lacks historical merit and was probably invented in the 11th century to authenticate relics at the Abbey of St Denis. In fact, the Sancta Camisa was a gift to the cathedral from Charles the Bald and there is no evidence for its being an important object of pilgrimage prior to the 12th century. In 1194, when the Cathedral was struck by lightning, and the east spire was lost, the Sancta Camisa was thought lost, too. However, it was found three days later, protected by priests, who fled behind iron trapdoors when the fire broke out. Some research suggests that depictions in the cathedral, e.g. Mary's infertile parents Joachim and Anne, harken back to the pre-Christian cult of a fertility goddess, and women would come to the well at this location in order to pray for their children and that some refer to that past. Chartres historian and expert Malcolm Miller rejected the claims of pre-Cathedral, Celtic, ceremonies and buildings on the site in a documentary. However, the widespread belief that the cathedral was also the site of a pre-Christian druidical sect who worshipped a "Virgin who will give birth" is purely a late-medieval invention. By the end of the 12th century the church had become one of the most important popular pilgrimage destinations in Europe. There were four great fairs which coincided with the main feast days of the Virgin Mary: the Presentation, the Annunciation, the Assumption and the Nativity. The fairs were held in the area administered by the cathedral and were attended by many of the pilgrims in town to see the cloak of the Virgin. Specific pilgrimages were also held in response to outbreaks of disease. When ergotism (more popularly known in the Middle Ages as "St. Anthony's fire") afflicted many victims, the crypt of the original church became a hospital to care for the sick. Today Chartres continues to attract large numbers of pilgrims, many of whom come to walk slowly around the labyrinth, their heads bowed in prayer – a devotional practice that the cathedral authorities accommodate by removing the chairs from the nave on Fridays from Lent to All Saints' Day (except for Good Friday). There have been at least five cathedrals on this site, each replacing an earlier building damaged by war or fire. Nothing survives of the earliest church, which was destroyed during an attack on the city by the Danes in 858. Of the Carolingian church that replaced it, all that remains is a semicircular chamber located directly below the centre of the present apse. This chamber, known as the Lubinus Crypt (named after the mid-6th-century Bishop of Chartres), is lower than the rest of the crypt and may have been the shrine of a local saint, prior to the church's rededication to the Virgin. Another fire in 962 is mentioned in the annals, though nothing is known about the subsequent rebuilding. A more serious conflagration occurred in 1020, after which Bishop Fulbert (bishop from 1006 to 1028) began the construction of an entirely new building. Most of the present crypt, which is the largest in France, dates from that period. The rebuilding proceeded in phases over the next hundred years or so, culminating in 1145 in a display of public enthusiasm dubbed the "Cult of the Carts" – one of several such incidents recorded during the period. It was claimed that during this religious outburst, a crowd of more than a thousand penitents dragged carts filled with building supplies and provisions including stones, wood, grain, etc. to the site. In 1134, another fire damaged the town, and perhaps part of the cathedral. The north tower was started immediately afterwards – the south tower some time later. From the beginning, it was intended that these towers flank a central porch of some sort and a narthex. When the north tower rose to the level of the second storey, the south was begun – the evidence lies in the profiles and in the masons marks on the two levels of the two towers. Between them on the first level, a chapel was constructed to Saint Michael. Traces of the vaults and the shafts which supported them are still visible in the western two bays. This chapel was probably vaulted, and those vaults saved the western glass. The stained glass in the three lancets over the portals date from some time between 1145 and 1155, while the south spire, some 103 metres high, was also completed by 1155 or later. Work was begun on the Royal Portal with the south lintel around 1136 and with all its sculpture installed up to 1141. Opinions are uncertain as the sizes and styles of the figures vary and some elements, such as the lintel over the right-hand portal, have clearly been cut down to fit the available spaces. The sculpture was originally designed for these portals, but the layouts were changed by successive masters, see careful lithic analysis by John James. Either way, most of the carving follows the exceptionally high standard typical of this period and exercised a strong influence on the subsequent development of gothic portal design. Some of the masters have been identified by John James, and drafts of these studies have been published on the web site of the International Centre of Medieval Art, New York. On 10 June 1194, another fire caused extensive damage to Fulbert's cathedral. The true extent of the damage is unknown, though the fact that the lead cames holding the west windows together survived the conflagration intact suggests contemporary accounts of the terrible devastation may have been exaggerated. Either way, the opportunity was taken to begin a complete rebuilding of the choir and nave in the latest style. The undamaged western towers and façade were incorporated into the new works, as was the earlier crypt, effectively limiting the designers of the new building to the same general plan as its predecessor. In fact the present building is only marginally longer than Fulbert's cathedral. One of the unusual features of Chartres cathedral is the speed with which it was built – a factor which helped contribute to the consistency of its design. Even though there were innumerable changes to the details, the plan remains remarkably consistent. The major change occurred six years after work began when the seven deep chapels around the choir opening off a single ambulatory were turned into shallow recesses opening off a double-aisled ambulatory. Australian architectural historian John James, who made a detailed study of the cathedral, has estimated that there were about 300 men working on the site at any one time, although it has to be acknowledged that current knowledge of working practices at this time is somewhat limited. Normally medieval churches were built from east to west so that the choir could be completed first and put into use (with a temporary wall sealing off the west end) while the crossing and nave were completed. Canon Delaporte argued that building work started at the crossing and proceeded outwards from there, but the evidence in the stonework itself is unequivocal, especially within the level of the triforium: the nave was at all times more advanced than ambulatory bays of the choir, and this has been confirmed by dendrochronology. The history of the cathedral has been plagued by more theories than any other, a singular problem for those attempting to discover the truth. For example, Louis Grodecki argued that the lateral doors of the transept portals were cut through the walls at a later date, and van der Meulen that they had wanted to rebuild the western portals (then only 50 years old). None of these theories refer back to the actual stonework, and it is only when one has done so, as John James did exhaustively in 1969, that one realizes that the construction process was in fact simple and logical. It is important to remember that the builders were not working on a clean site but would have had to clear back the rubble and surviving parts of the old church as they built the new. Nevertheless, work progressed rapidly. The south porch with most of its sculpture was installed by 1210, and by 1215 the north porch had been completed and the western rose installed. The nave high vaults were erected in the 1220s, the canons moved into their new stalls in 1221 under a temporary roof at the level of the clerestory, and the transept roses were erected over the subsequent two decades. The high vaults over the choir were not built until the last years of the 1250s, as was rediscovered in the first decade of the 21st century. Each arm of the transept was originally meant to support two towers, two more were to flank the choir, and there was to have been a central lantern over the crossing – nine towers in all. Plans for a crossing tower were abandoned in 1221 and the crossing was vaulted over. Work on the remaining six towers continued at a slower pace for some decades, until it was decided to leave them without spires (as at Laon Cathedral and elsewhere). The cathedral was consecrated on 24 October 1260 in the presence of King Louis IX of France, whose coat of arms was painted over the apsidal boss. Compared with other medieval churches, relatively few changes have been made to the cathedral since its consecration. In 1323 a substantial two story construction was added at the eastern end of the choir, with a chapel dedicated to Saint Piat in the upper floor accessed by a staircase opening onto the ambulatory (the chapel of St Piat is normally closed to visitors, although it occasionally houses temporary exhibitions). The chamber below the chapel served the canons as their chapter house. Shortly after 1417, a small chapel was placed between the buttresses of the south nave for the Count of Vendôme. At the same time the small organ that had been built in the nave aisle was moved up into the triforium where it remains, though some time in the sixteenth century it was replaced with a larger one on a raised platform at the western end of the building. To this end, some of the interior shafts in the western bay were removed and plans made to rebuild the organ there. In any event, this plan was abandoned, the glass in the western lancets was retained and the old organ was replaced with the present one. In 1506, lightning destroyed the north spire, which was rebuilt in the 'Flamboyant' style by local mason Jehan de Beauce (who also worked on the abbey church in Vendôme). It is 113 metres high and took seven years to construct. After its completion Jehan continued working on the cathedral, and began the monumental screen around the choir stalls, which was not completed until the beginning of the eighteenth century. In 1757, a number of changes were made to the interior to increase the visibility of the Mass, in accordance with changing religious customs. The jubé (choir screen) that separated the liturgical choir from the nave was torn down and the present stalls built (some of the magnificent sculpture from this screen was later found buried underneath the paving and preserved, though it is not on public display). At the same time, some of the stained glass in the clerestory was removed and replaced with grisaille windows, greatly increasing the illumination of the High Altar. In 1836, the old lead-covered roof, with its complex structure of timber supports (known as 'the forest') was destroyed by fire. It was replaced with a copper-clad roof supported by a network of cast iron ribs, known as the Charpente de fer. At the time, the framework over the crossing had the largest span of any iron framed construction in Europe. The cathedral was damaged in the French Revolution when a mob began to destroy the sculpture on the north porch. This is one of the few occasions on which the anti-religious fervour was stopped by the townfolk. The Revolutionary Committee decided to destroy the cathedral via explosives, and asked a local architect to organise it. He saved the building by pointing out that the vast amount of rubble from the demolished building would so clog the streets it would take years to clear away. However, when metal was needed for the army the brass plaque in the centre of the labyrinth was removed and melted down; the only record of what was on the plaque is Felibien's description. The Cathedral of Chartres was therefore neither destroyed nor looted during the French Revolution and the numerous restorations have not diminished its reputation as a triumph of Gothic art. The cathedral has been spared the damage suffered by so many during the Wars of Religion and the Revolution, though the lead roof was removed to make bullets and the Directorium threatened to destroy the building as its upkeep, without a roof, had become too onerous. All the glass from the cathedral was removed in 1939 just before the Germans invaded France, and it was cleaned after the War and releaded before replacing. While the city suffered heavy damage by bombing in the course of World War II, the cathedral was spared by an American Army officer who challenged the order to destroy it. Colonel Welborn Barton Griffith, Jr. questioned the strategy of destroying the cathedral and volunteered to go behind enemy lines to find out whether the German Army was occupying the cathedral and using it as an observation post. With a single enlisted soldier to assist, Griffith proceeded to the cathedral and confirmed that the Germans were not using it. After he returned from his reconnaissance, he reported that the cathedral was clear of enemy troops. The order to destroy the cathedral was withdrawn, and the Allies later liberated the area. Griffith was killed in action later that day on 16 August 1944, in the town of Leves, near Chartres. In 2009, the Monuments Historiques division of the French Ministry of Culture began an $18.5-million program of works at the cathedral, described as a restoration project. Part of the project involved painting the interior masonry creamy-white, with trompe l’oeil marbling and gilded detailing. The goal of the project, which is due for completion in 2017, is to make the cathedral look as it would have looked when finished in the 13th century. The goal of the project and its results were widely condemned. Architectural critic Alexander Gorlin described the goal as a "great lie", writing that the "idea that the 13th century interior of Chartres can be recreated is so totally absurd as to be laughable" and that it is "against every single cultural trend today that values the patina of age and the mark of time rather than the shiny bling of cheap jewelry and faux finishes". Alasdair Palmer called the project an "ill-conceived makeover". Architectural historian Martin Filler described the work as a "scandalous desecration of a cultural holy place", an "unfolding cultural disaster", and that it violated international conservation protocols, in particular the 1964 Charter of Venice of which France is a signatory. President of the Friends of Chartres Cathedral Isabelle Paillot defended the restoration work as necessary to prevent the building from crumbling. The cathedral is still the seat of the Bishop of Chartres of the Diocese of Chartres, though in the ecclesiastical province of Tours. Every evening since the events of 11 September 2001, vespers are sung by the Chemin Neuf Community. Chartres floorplan (1856) by Eugène Viollet-le-Duc (1814–1879). The plan is cruciform. A two bay narthex at the western end opens into a seven bay nave leading to the crossing, from which wide transepts extend three bays each to north and south. East of the crossing are four rectangular bays terminating in a semicircular apse. The nave and transepts are flanked by single aisles, broadening to a double-aisled ambulatory around the choir and apse. From the ambulatory radiate three deep semi-circular chapels (overlying the deep chapels of Fulbert's 11th-century crypt) and three much shallower ones. Of the latter, one was effectively lost in the 1320s when the Chapel of St Piat was built. Plan of the labyrinth of Chartres Cathedral. The elevation of the nave is three-storied, with arcade, triforium and clerestory levels. By eschewing the gallery level that featured in many early Gothic cathedrals (normally between arcade and triforium), the designers were able to make the richly glazed arcade and clerestory levels larger and almost equal in height, with just a narrow dark triforium in between. 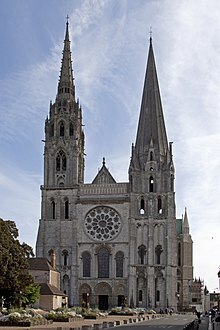 Although not the first example of this three-part elevation, Chartres was perhaps the first of the great churches to make a success of it and to use the same design consistently throughout. The result was a far greater area of window openings. These windows were entirely glazed with densely colored glass, which resulted in a relatively dark interior – but one which accentuated the richness of the glass and the colored light that filtered through them. Increasing the size of the windows meant reducing the wall area considerably, something which was made possible only by the extensive use of flying buttresses on the outside. These buttresses supported the considerable lateral thrusts resulting from the 34m high stone vaults, higher and wider than any attempted before in France. These vaults were quadripartite, each bay split into four webs by two diagonally crossing ribs, unlike the sexpartite vaults adopted in many earlier Gothic cathedrals such as at Laon. Another architectural breakthrough at Chartres was a resolution to the problem of how to arrange attached columns or shafts around a pier in a way that worked aesthetically – but which also satisfied the desire for structural logic that characterised French high gothic. The nave at Chartres features alternating round and octagonal solid cored piers, each of which has four attached half-columns at the cardinal points, two of which (on the east-west axis) support the arches of the arcade, one acts as the springing for the aisle vault and one supports the cluster of shafts that rise through the triforium and clerestory to support the high-vault ribs. This pier design, known as pilier cantonné was to prove highly influential and subsequently featured in a number of other high gothic churches. Although the sculpture on the portals at Chartres is generally of a high standard, the various carved elements inside, such as the capitals and string courses, are relatively poorly finished (when compared for example with those at Reims or Soissons) – the reason is simply that the portals were carved from the finest Parisian limestone, or ' 'calcaire' ', while the internal capitals were carved from the local "Berchères stone", that is hard to work and can be brittle. Perhaps the most distinctive feature of Chartres Cathedral is the extent to which architectural structure has been adapted to meet the needs of stained glass. The use of a three-part elevation with external buttressing allowed for far larger windows than earlier designs, particularly at the clerestory level. Most cathedrals of the period had a mixture of windows containing plain or grisaille glass and windows containing dense stained glass panels, with the result that the brightness of the former tended to diminish the impact and legibility of the latter. At Chartres, nearly all of the 176 windows were filled with equally dense stained glass, creating a relatively dark but richly coloured interior in which the light filtering through the myriad narrative and symbolic windows was the main source of illumination. The majority of the windows now visible at Chartres were made and installed between 1205 and 1240, but four lancets preserve panels of Romanesque glass from the 12th century which survived the fire of 1195. Three of these are located beneath the rose in the west façade: the Passion window to the south, the Infancy of Christ in the centre and a Tree of Jesse to the north. All three of these windows were originally made around 1145 but were restored in the early 13th century and again in the 19th. The other 12th-century window, perhaps the most famous at Chartres, is the so-called « Notre-Dame de la Belle-Verrière », found in the first bay of the choir after the south transept. This window is actually a composite; the upper part, showing the Virgin and child surrounded by adoring angels, dates from around 1180 and was probably positioned at the centre of the apse in the earlier building. The Virgin is depicted wearing a blue robe and sitting in a frontal pose on a throne, with the Christ Child seated on her lap raising his hand in blessing. This composition, known as the Sedes sapientiae ('Throne of Wisdom'), which also appears on the Portail royal, is based on the famous cult figure kept in the crypt. The lower part of the window, showing scenes from the Infancy of Christ, dates from the main glazing campaign around 1225. Each bay of the aisles and the choir ambulatory contains one large lancet window, most of them roughly 8.1m high by 2.2m wide. The subjects depicted in these windows, made between 1205 and 1235, include stories from the Old and New Testament and the Lives of the Saints as well as typological cycles and symbolic images such as the signs of the zodiac and labours of the months, or the Good Samaritan parable. Most windows are made up of around 25–30 individual panels showing distinct episodes within the narrative; only « Notre-Dame de la Belle-Verrière » includes a larger image made up of multiple panels. Several of the windows at Chartres include images of local tradesmen or labourers in the lowest two or three panels, often with details of their equipment and working methods. Traditionally it was claimed that these images represented the guilds of the donors who paid for the windows. In recent years however this view has largely been discounted, not least because each window would have cost around as much as a large mansion house to make – while most of the labourers depicted would have been subsistence workers with little or no disposable income. Furthermore, although they became powerful and wealthy organisations in the later medieval period, none of these trade guilds had actually been founded when the glass was being made in the early 13th century. A more likely explanation is that the Cathedral clergy wanted to emphasise the universal reach of the Church, particularly at a time when their relationship with the local community was often a troubled one. Because of their greater distance from the viewer, the windows in the clerestory generally adopt simpler, bolder designs. Most feature the standing figure of a saint or Apostle in the upper two-thirds, often with one or two simplified narrative scenes in the lower part, either to help identify the figure or else to remind the viewer of some key event in their life. Whereas the lower windows in the nave arcades and the ambulatory consist of one simple lancet per bay, the clerestory windows are each made up of a pair of lancets with a plate-traceried rose window above. The nave and transept clerestory windows mainly depict saints and Old Testament prophets. Those in the choir depict the kings of France and Castile and members of the local nobility in the straight bays, while the windows in the apse hemicycle show those Old Testament prophets who foresaw the virgin birth, flanking scenes of the Annunciation, Visitation and Nativity in the axial window. The cathedral has three large rose windows. The western rose, made c.1215 and 12 m in diameter shows the Last Judgement – a traditional theme for west façades. A central oculus showing Christ as the Judge is surrounded by an inner ring of 12 paired roundels containing angels and the Elders of the Apocalypse and an outer ring of 12 roundels showing the dead emerging from their tombs and the angels blowing trumpets to summon them to judgement. The north transept rose (10.5 m diameter, made c.1235), like much of the sculpture in the north porch beneath it, is dedicated to the Virgin. The central oculus shows the Virgin and Child and is surrounded by 12 small petal-shaped windows, 4 with doves (the 'Four Gifts of the Spirit'), the rest with adoring angels carrying candlesticks. Beyond this is a ring of 12 diamond-shaped openings containing the Old Testament Kings of Judah, another ring of smaller lozenges containing the arms of France and Castille, and finally a ring of semicircles containing Old Testament Prophets holding scrolls. The presence of the arms of the French king (yellow fleurs-de-lis on a blue background) and of his mother, Blanche of Castile (yellow castles on a red background) are taken as a sign of royal patronage for this window. Beneath the rose itself are five tall lancet windows (7.5 m high) showing, in the centre, the Virgin as an infant held by her mother, St Anne – the same subject as the trumeau in the portal beneath it. Flanking this lancet are four more containing Old Testament figures. Each of these standing figures is shown symbolically triumphing over an enemy depicted in the base of the lancet beneath them – David over Saul, Aaron over Pharaoh, St Anne over Synagoga, etc. The south transept rose (10.5 m diameter, made c.1225–30) is dedicated to Christ, who is shown in the central oculus, right hand raised in benediction, surrounded by adoring angels. Two outer rings of twelve circles each contain the 24 Elders of the Apocalypse, crowned and carrying phials and musical instruments. The central lancet beneath the rose shows the Virgin carrying the infant Christ. Either side of this are four lancets showing the four evangelists sitting on the shoulders of four Prophets – a rare literal illustration of the theological principle that the New Testament builds upon the Old Testament. This window was a donation of the Mauclerc family, the Counts of Dreux-Bretagne, who are depicted with their arms in the bases of the lancets. On the whole, Chartres' windows have been remarkably fortunate. The medieval glass largely escaped harm during the Huguenot iconoclasm and the religious wars of the 16th century although the west rose sustained damage from artillery fire in 1591. The relative darkness of the interior seems to have been a problem for some. A few windows were replaced with much lighter grisaille glass in the 14th century to improve illumination, particularly on the north side and several more were replaced with clear glass in 1753 as part of the reforms to liturgical practice that also led to the removal of the jubé. The installation of the Vendôme Chapel between two buttresses of the nave in the early 15th century resulted in the loss of one more lancet window, though it did allow for the insertion of a fine late-gothic window with donor portraits of Louis de Bourbon and his family witnessing the Coronation of the Virgin with assorted saints. Although estimates vary (depending on how one counts compound or grouped windows) approximately 152 of the original 176 stained glass windows survive – far more than any other medieval cathedral anywhere in the world. Like most medieval buildings, the windows at Chartres suffered badly from the corrosive effects of atmospheric acids during the Industrial Revolution and thereafter. The majority of windows were cleaned and restored by the famous local workshop Atelier Lorin at the end of the 19th century but they continued to deteriorate. During World War II most of the stained glass was removed from the cathedral and stored in the surrounding countryside to protect it from damage. At the close of the war the windows were taken out of storage and reinstalled. Since then an ongoing programme of conservation has been underway and isothermal secondary glazing was gradually installed on the exterior to protect the windows from further damage. Wikimedia Commons has media related to Stained glass windows of Cathédrale Notre-Dame de Chartres. One of the few elements to survive from the mid-12th-century church, the Portail royal was integrated into the new cathedral built after the 1194 fire. Opening on to the parvis (the large square in front of the cathedral where markets were held), the two lateral doors would have been the first entry point for most visitors to Chartres, as it remains today. The central door is only opened for the entry of processions on major festivals, of which the most important is the Adventus or installation of a new bishop. The harmonious appearance of the façade results in part from the relative proportions of the central and lateral portals, whose widths are in the ratio 10:7 – one of the common medieval approximations of the square root of 2. As well as their basic functions of providing access to the interior, portals are the main locations for sculpted images on the gothic cathedral and it is on the west façade at Chartres that this practice began to develop into a visual summa or encyclopedia of theological knowledge. Each of the three portals focuses on a different aspect of Christ's role; his earthly incarnation on the right, his second coming on the left and his eternal aspect in the centre. Above the right portal, the lintel is carved in two registers with (lower) the Annunciation, Visitation, Nativity, Annunciation to the Shepherds and (upper) the Presentation in the Temple. Above this the tympanum shows the Virgin and Child enthroned in the Sedes sapientiae pose. Surrounding the tympanum, as a reminder of the glory days of the School of Chartres, the archivolts are carved with some very distinctive personifications of the Seven Liberal Arts as well as the classical authors and philosophers most closely associated with them. The left portal is more enigmatic and art historians still argue over the correct identification. The tympanum shows Christ standing on a cloud, apparently supported by two angels. Some see this as a depiction of the Ascension of Christ (in which case the figures on the lower lintel would represent the disciples witnessing the event) while others see it as representing the Parousia, or Second Coming of Christ (in which case the lintel figures could be either the prophets who foresaw that event or else the 'Men of Galilee' mentioned in Acts 1:9-11). The presence of angels in the upper lintel, descending from a cloud and apparently shouting to those below, would seem to support the latter interpretation. The archivolts contain the signs of the zodiac and the labours of the months – standard references to the cyclical nature of time which appear in many gothic portals. The central portal is a more conventional representation of the End of Time as described in the Book of Revelation. In the centre of the tympanum is Christ within a mandorla, surrounded by the four symbols of the evangelists (the Tetramorph). The lintel shows the Twelve Apostles while the archivolts show the 24 Elders of the Apocalypse. Although the upper parts of the three portals are treated separately, two sculptural elements run horizontally across the façade, uniting its different parts. Most obvious are the jamb statues affixed to the columns flanking the doorways – tall, slender standing figures of kings and queens from whom the Portail royal derived its name. Although in the 18th and 19th century these figures were mistakenly identified as the Merovingian monarchs of France (thus attracting the opprobrium of Revolutionary iconoclasts) they almost certainly represent the kings and queens of the Old Testament – another standard iconographical feature of gothic portals. Less obvious than the jamb statues but far more intricately carved is the frieze that stretches all across the façade in the sculpted capitals on top of the jamb columns. Carved into these capitals is a very lengthy narrative depicting the life of the Virgin and the life and Passion of Christ. In northern Europe it is common for the iconography on the north side of a church to focus on Old Testament themes, with stories from the lives of the saints and the Gospels being more prominent on the physically (and hence, spiritually) brighter southern side. Chartres is no exception to this general principle and the north transept portals, with their deep sheltering porches, concentrate on the precursors of Christ, leading up to the moment of His incarnation, with a particular emphasis on the Virgin Mary. The overall iconographical themes are clearly laid-out; the glorification of Mary in the centre, the incarnation of her son on the left and Old Testament prefigurations and prophecies on the right. One major exception to this scheme is the presence of large statues of St Modesta (a local martyr) and St Potentian on the north west corner of the porch, close to a small doorway where pilgrims visiting the crypt (where their relics were stored) would once have emerged blinking into the light. As well as the main sculptural areas around the portals themselves, the deep porches are filled with myriad other carvings depicting a range of subjects including local saints, Old Testament narratives, naturalistic foliage, fantastical beasts, Labours of the Months and personifications of the 'active and contemplative lives' (the vita activa and vita contemplativa). The personifications of the vita activa (directly overhead, just inside the inside of the left hand porch) are of particular interest for their meticulous depictions of the various stages in the preparation of flax – an important cash-crop in the area during the Middle Ages. South elevation by Jean-Baptiste Lassus (1867). If the north transept portals are all about the time leading up to Christ's incarnation and the west façade is about the events of his life and Passion, then the iconography of the south transept portals addresses the time from Christ's death until his Second Coming. The central portal concentrates on the Last Judgement and the Apostles, the left portal on the lives of martyrs and the right on confessor saints (an arrangement also reflected in the windows of the apse). Just like their northern counterparts, the south transept portals open into deep porches which greatly extend the space available for sculptural embellishment. A large number of subsidiary scenes depict conventional themes like the labours of the months and the signs of the zodiac, personifications of the virtues and vices and also further scenes from the lives of the martyrs (left porch) and confessors (right porch). In the Middle Ages the cathedral also functioned as an important cathedral school. In the early 11th century Bishop Fulbert established Chartres as one of the leading schools in Europe. Although the role of Fulbert himself as a scholar and teacher has been questioned, perhaps his greatest talent was as an administrator, who established the conditions in which the school could flourish, as well as laying the foundations for the rebuilding of the cathedral after the fire of 1020. Great scholars were attracted to the cathedral school, including Thierry of Chartres, William of Conches and the Englishman John of Salisbury. These men were at the forefront of the intense intellectual rethinking that culminated in what is now known as the twelfth-century renaissance, pioneering the Scholastic philosophy that came to dominate medieval thinking throughout Europe. By the early 12th century the status of the School of Chartres was on the wane. 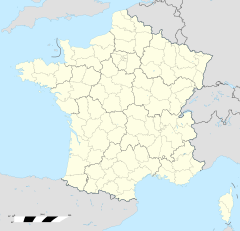 It was gradually eclipsed by the newly emerging University of Paris, particularly at the School of the Abbey of St Victoire (the "Victorines"). By the middle of the century the importance of Chartres Cathedral had begun to shift away from education and towards pilgrimage, a changing emphasis reflected in the subsequent architectural developments. Now this has been standing here for centuries. The premier work of man perhaps in the whole western world and it’s without a signature: Chartres. A celebration to God’s glory and to the dignity of man. All that’s left most artists seem to feel these days, is man. Naked, poor, forked radish. There aren’t any celebrations. Ours, the scientists keep telling us, is a universe, which is disposable. You know it might be just this one anonymous glory of all things, this rich stone forest, this epic chant, this gaiety, this grand choiring shout of affirmation, which we choose when all our cities are dust, to stand intact, to mark where we have been, to testify to what we had it in us, to accomplish. Our works in stone, in paint, in print are spared, some of them for a few decades, or a millennium or two, but everything must finally fall in war or wear away into the ultimate and universal ash. The triumphs and the frauds, the treasures and the fakes. A fact of life. We’re going to die. "Be of good heart," cry the dead artists out of the living past. Our songs will all be silenced – but what of it? Go on singing. Maybe a man’s name doesn’t matter all that much. I'm back in the Middle Ages. I'm back in the world that I was brought up in as a child, the Roman Catholic spiritual-image world, and it is magnificent ... That cathedral talks to me about the spiritual information of the world. It's a place for meditation, just walking around, just sitting, just looking at those beautiful things. Joris-Karl Huysmans includes detailed interpretation of the symbolism underlying the art of Chartres Cathedral in his 1898 semi-autobiographical novel La cathédrale. Chartres was the primary basis for the fictional Cathedral in David Macaulay's Cathedral: The Story of Its Construction and the animated special based on this book. Chartres was a major character in the religious thriller Gospel Truths by J. G. Sandom. The book used the Cathedral's architecture and history as clues in the search for a lost Gospel. The cathedral is featured in the television travel series The Naked Pilgrim; presenter Brian Sewell explores the cathedral and discusses its famous relic – the nativity cloak said to have been worn by the Virgin Mary. Popular action-adventure video game Assassin's Creed features a climbable cathedral modeled heavily on the Chartres Cathedral. One of the attractions at the Chartres Cathedral is the Chartres Light Celebration, when not only is the cathedral lit, but so are many buildings throughout the town, as a celebration of electrification. ^ "Mérimée database". French government. Retrieved 1 February 2013. ^ "Chartres Cathedral". UNESCO World Heritage Center. ^ Otto von Simson, The Gothic Cathedral, 2nd Ed. New York, 1962, p. 167. ^ For a definitive study of the social and economic life of medieval Chartres based on archive documents, see; André Chédeville, Chartres et ses campagnes au Moyen Âge : XIe au XIIIe siècles, Paris, 1992. ^ See Jane Welch Williams, Bread, wine & money: the windows of the trades at Chartres Cathedral, Chicago, 1993, especially p. 21ff. ^ Spitzer, Laura (1994). "The Cult of the Virgin and Gothic Sculpture: Evaluating Opposition in the Chartres West Facade Capital Frieze". Gesta. 33 (2): 132–150. doi:10.2307/767164. JSTOR 767164. ^ "The Cathedral of Our Lady of Chartres (part 1 of 2)". Unknown. 28 May 2011. Retrieved 22 April 2018. ^ Favier, Jean. The World of Chartres. New York: Henry N. Abrams, 1990. p. 31. ISBN 978-0-8109-1796-5. ^ Jan van der Meulen, Notre-Dame de Chartres: Die vorromanische Ostanlage, Berlin 1975. ^ Honour, H. and Fleming, J. The Visual Arts: A History, 7th ed., Saddle River, New Jersey: Pearson Prentice Hall, 2005. 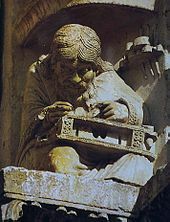 ^ John James, "La construction du narthex de la cathédrale de Chartres", ' 'Bulletin de la Société Archéologique d’Eure-et-Loir' ', lxxxvii 2006, 3–20. Also in English in ' 'In Search of the unknown in medieval architecture' ', 2007, Pindar Press, London. ^ John James, "An Examination of Some Anomalies in the Ascension and Incarnation Portals of Chartres Cathedral", Gesta, 25:1 (1986) pp. 101–108. ^ C. Edson Armi, The "Headmaster" of Chartres and the Origins of "Gothic" Sculpture, Penn. State, 1994. ^ "John James | International Center of Medieval ArtInternational Center of Medieval Art". Medievalart.org. Retrieved 2013-03-12. ^ John James, ' 'The contractors of Chartres' ', Wyong, ii vols. 1979–81. ^ Louis Grodecki, "Chronologie de la cathédrale de Chartres", ' 'Bulletin monumental' ', cxvi 1958, 91–119. ^ James, John (1990). The Master Masons of Chartres. London; New York; Chartres; Sydney. ISBN 978-0-646-00805-9. ^ Lautier, Claudine (2011). "Restaurations récentes à la cathédrale de Chartres et nouvelles recherches". Bulletin Monumental. 169. ^ Favier, Jean. The World of Chartres. New York: Henry N. Abrams, 1990. p. 160. ISBN 978-0-8109-1796-5. ^ "Chartres Cathedral – Cathédrale Notre-Dame de Chartres". ^ a b MilitaryTimes.com. "MilitaryTimes Hall of Valor". Welborn Barton Griffith, Jr. Military Times, a Gannett Company. Archived from the original on 18 January 2012. Retrieved 10 May 2011. Note: The Distinguished Service Cross was awarded posthumously for saving the cathedral. ^ Jay Nordlinger (2011). "A Colonel at Chartres". The Corner. NationalReview.com. Retrieved 11 May 2011. ^ Alasdair Palmer, Restoration tragedy, The Spectator 12 May 2012. ^ Lichfield, John (23 October 2015). "Let there be light? Chartres Cathedral caught in clean-up row". Independent. Fassler, Margot E. The Virgin of Chartres: Making History Through Liturgy and the Arts (Yale University Press; 2010) 612 pages; Discusses Mary's gown and other relics held by the Chartres Cathedral in a study of history making and the cult of the Virgin of Chartres in the 11th and 12th centuries. Houvet, E. An Illustrated Monograph of Chartres Cathedral: (Being an Extract of a Work Crowned by Académie des Beaux-Arts). s.l. : s.n., 1930. James, John, The Master Masons of Chartres, West Grinstead, 1990, ISBN 978-0-646-00805-9. Mâle, Emile. Notre-Dame de Chartres. New York: Harper & Row, 1983. Miller, Malcolm. Chartres Cathedral. New York: Riverside Book Co., 1997. ISBN 978-1-878351-54-8. Wikimedia Commons has media related to Cathedral of Chartres. Wikimedia Commons has media related to Zodiac on Chartres cathedral stained glass windows. Chartres Cathedral on the Corpus of Medieval Narrative Art Panel-by-panel photographs of many of the windows.